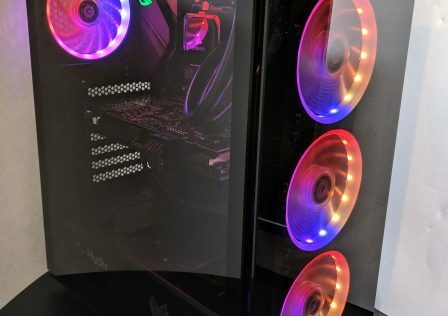 Any proper PC build needs a solid foundation you can rely on to keep your internal components running smoothly. In this case, we’re referring to your power supply which is one of the most integral and important parts in your system. 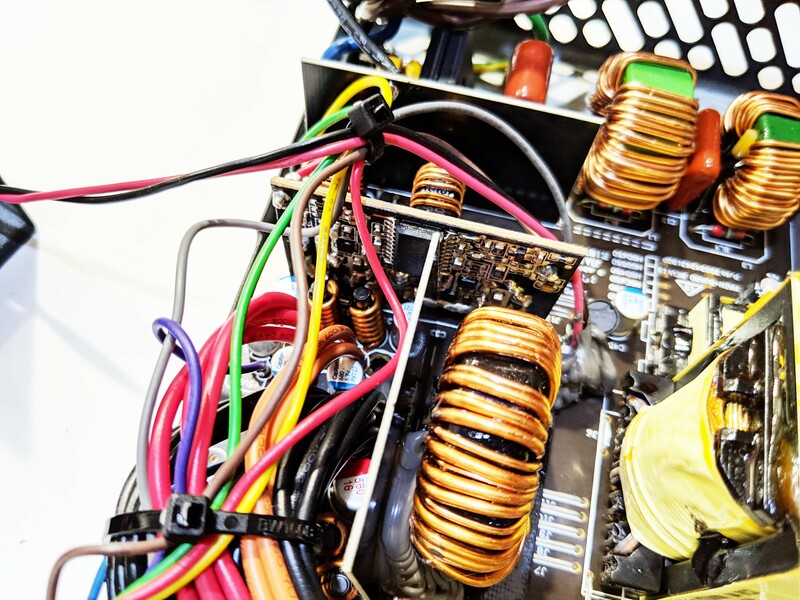 Selecting a proper power supply can make or break your build in the long run which can end up costing you more than you’d save initially. 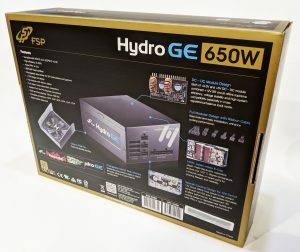 In this review we’ll be taking an in depth look at the FSP Hydro GE 650W which carries an 80+ Gold rating with a fully modular design in a modern looking shell. 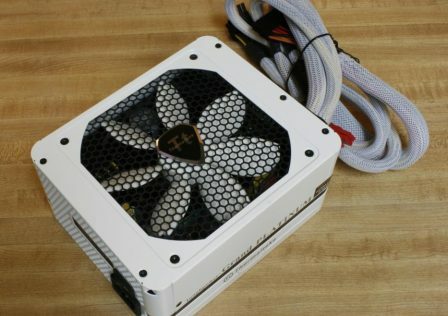 With PSU technology on the rise, there is almost no need to look at anything less than an 80+ Gold rated PSU. 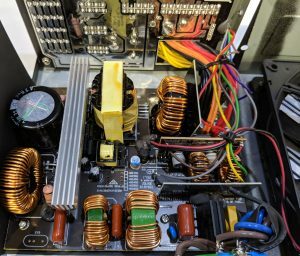 Back in the day, an efficient rated PSU would cost you an arm and a leg, however, today, they are almost becoming the new standard. Personally, I don’t recommend anything less than Gold, for two reasons. First, a more efficient PSU will save you a bit of power. 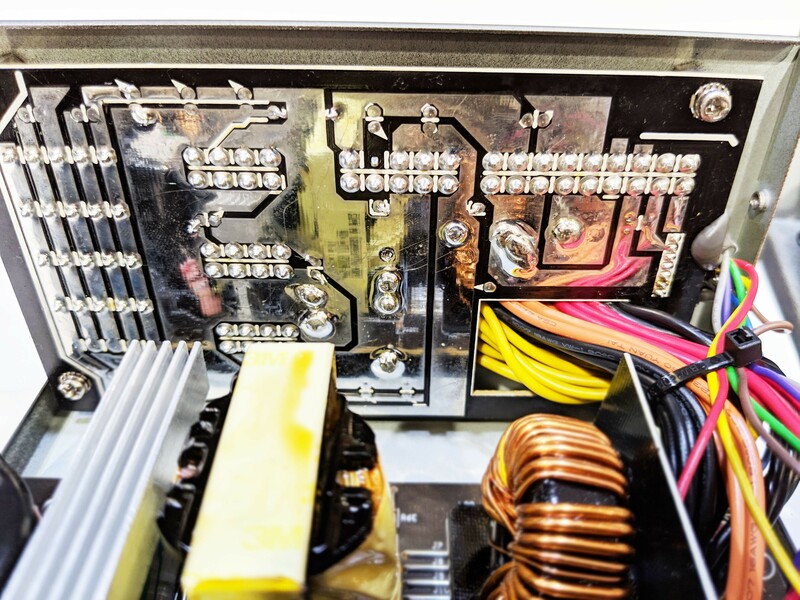 Second, higher rated power supplies are typically constructed of higher rated and/or higher quality components which tend to last longer. 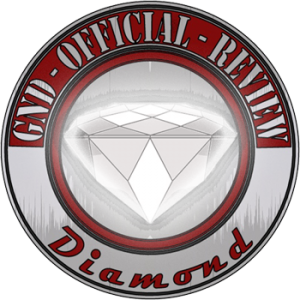 Check our our detailed guide covering 80+ ratings if you’d like to learn more. 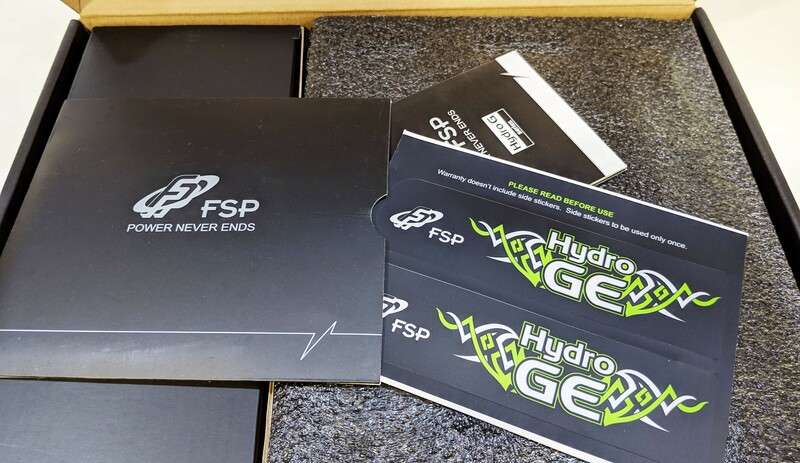 The construction of the FSP Hydro GE 650W on paper looks pretty good. 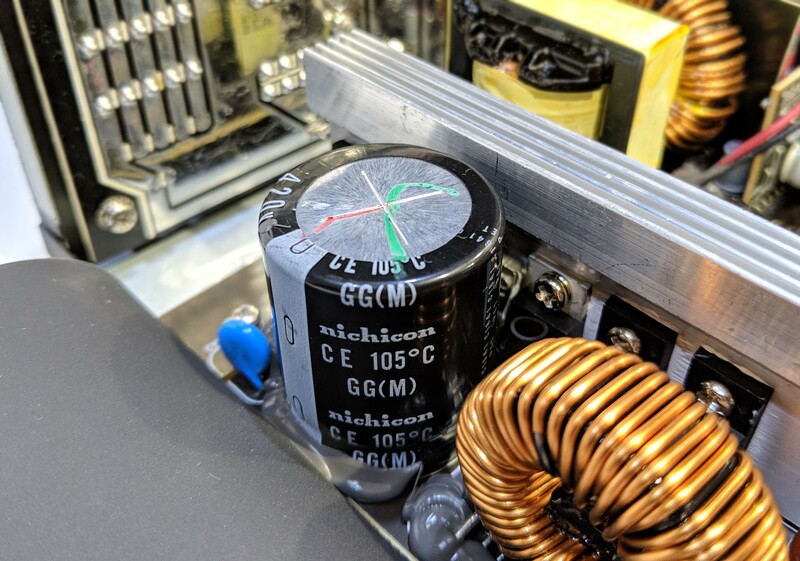 On FSP’s website featuring the product, we can see that they’ve opted for 100% Japanese capacitors (105C rated) and features modern protection features such as OCP, OVP, OPP, SCP, UVP, and OTP to help keep your internal components safe. The Hydro GE series is also available in 550W and 450W power output ratings depending on your need. 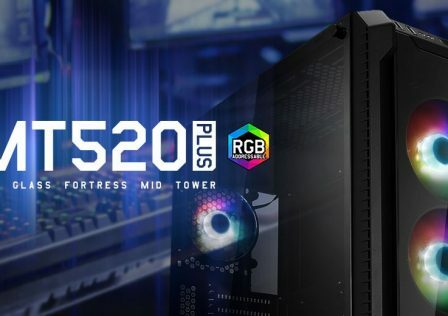 A 650W rated PSU is perfect for modern desktop systems featuring a single high end GPU. 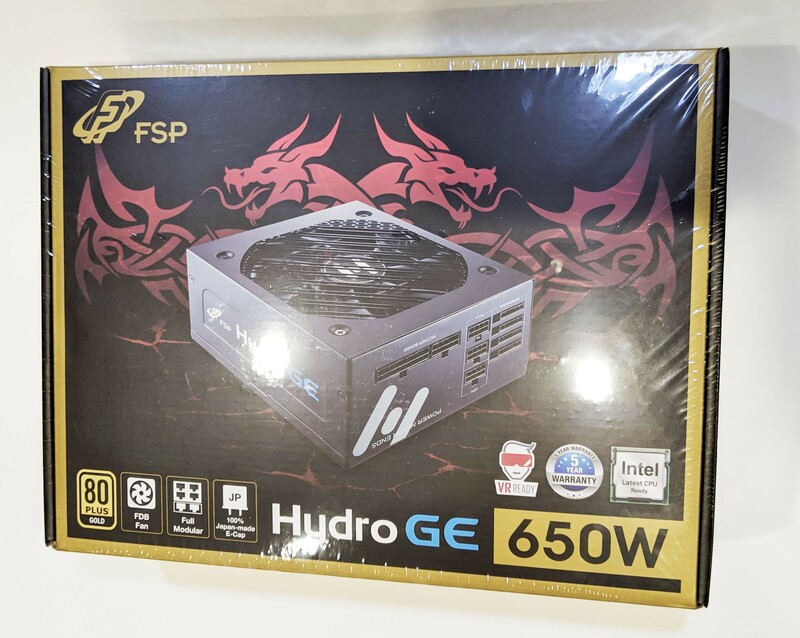 At the time of writing this review, the FSP Hydro GE 650W PSU can be found for $79.99 USD. 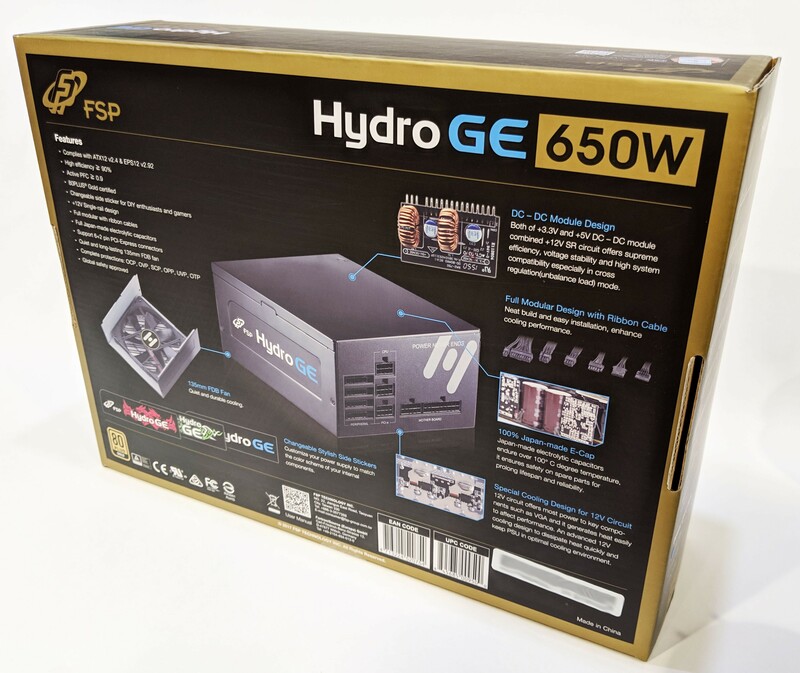 As mentioned earlier, the FSP PSU carries an 80+ Gold efficiency rating which means it is able to convert power from coming from your wall into DC power that your system is able to use at 87-90% based on load. 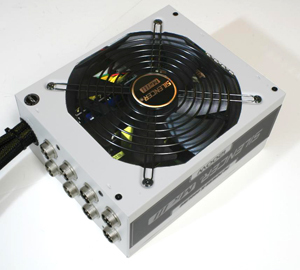 Most of the power supply’s power output is provided by a single +12V rail which seems to be the most popular configuration on the market today especially for anything under 750W. Below are the detailed specifications provided by FSP Group. The technical details regarding the input and output electrical specifications is also provided. 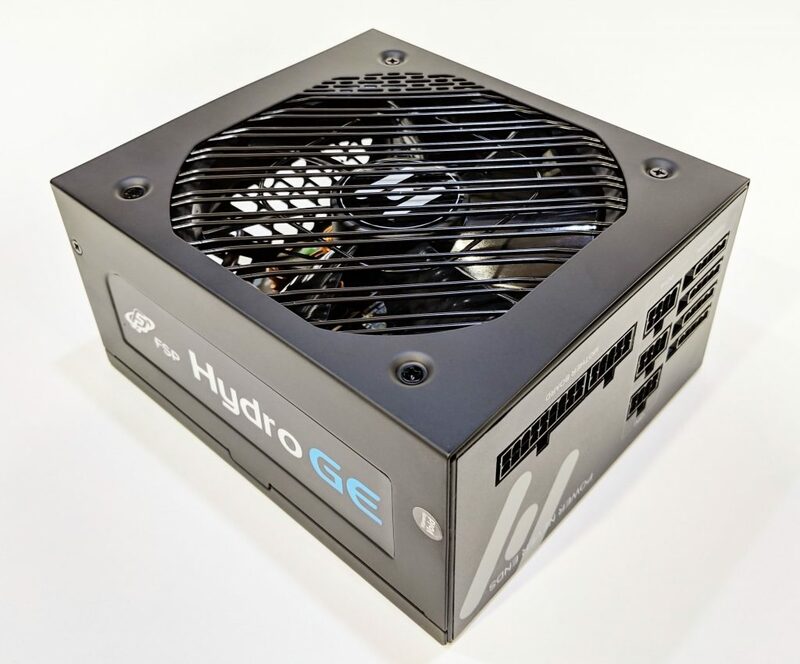 Note that the overall combined rating of the PSU is likely better than 650W as the +12V rail is capable of supplying 650W all on its own. 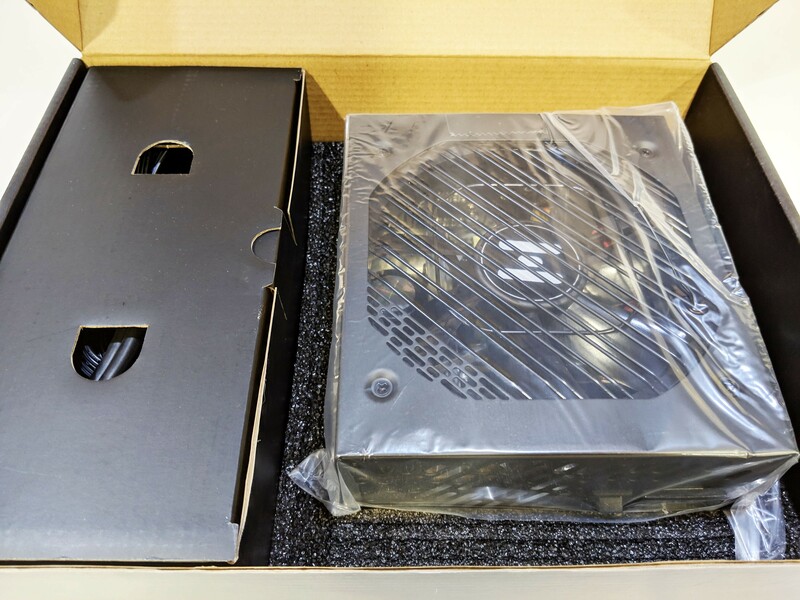 Now that we’re all technical experts on the PSU, let’s dive into the review first by examining the unit’s packaging! 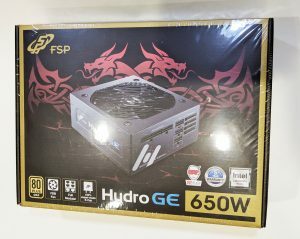 The FSP Hydro GE 650W PSU arrived at our secret GND-Tech test bunker in perfect health. The outside of the box is wrapped in plastic to reduce surface damage to the box. 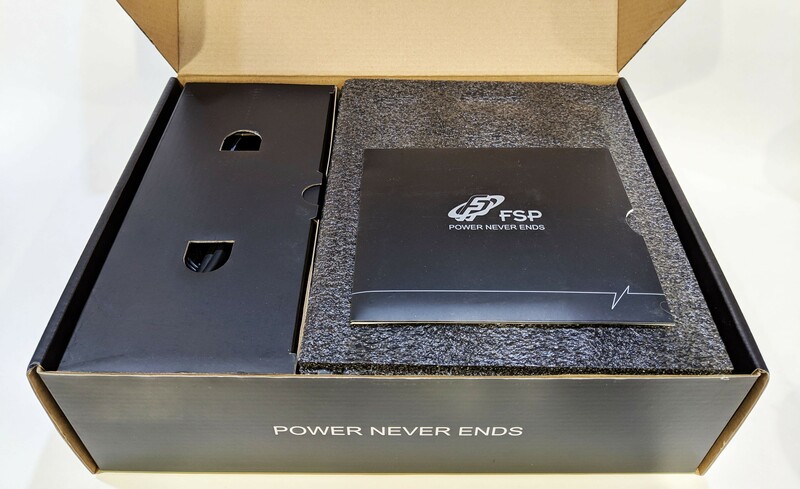 The box features some cool graphics with a depiction of the PSU in the front center. Lots of other bits of information are included on the front such as its overall wattage, efficiency rating, warranty (5 years), and a few others. The back of the box features a few more details such as cooling info, DC-to-DC design for the +3.3V an d +5V circuits, and Japanese capacitors to name a few. Overall, good and informative design choice! With the outer seal cracked, we’re able to get a better feel as to how this thing is packaged. At first glance, I like what I see. 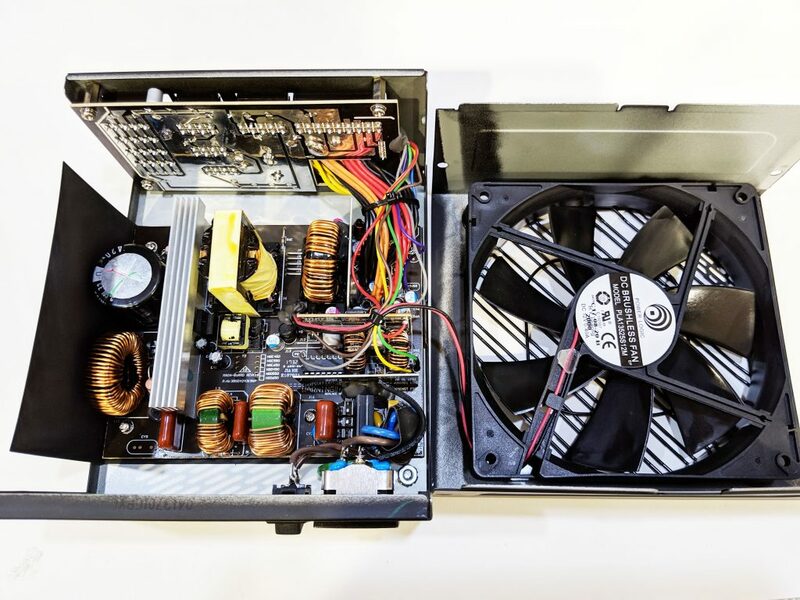 The PSU is fully enclosed in a bed of foam isolated from the rest of the included items. 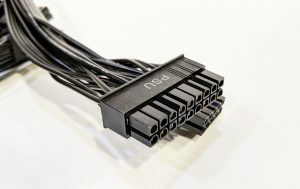 The foam blocks sandwich the PSU to provide protection on all six sides. 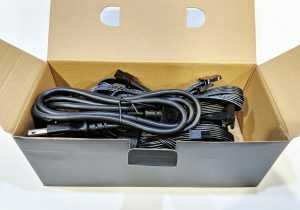 Included in the box is the PSU (obviously) a box containing all the modular cables plus and external power chord, case mounting screws, and a sleeve containing the manual as well as extra side stickers to customize the PSU to your unique build. The modular cables come bundled in a nice reusable Velcro cable strap. The PSU features an overall black color scheme with an overall mostly smooth texture on its surface. Each side features the FSP logo and Hydro GE model name. The side stickers can be swapped out for other included stickers for an overall black/green or black/red color scheme to better fit your specific build. 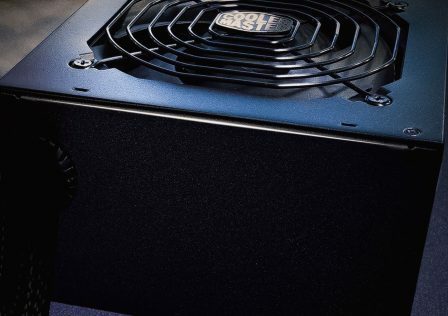 The top 135mm intake fan sits behind a custom diagonal wire mesh which gives the PSU a unique look. The diagonal mesh look continues towards the back of the unit where the hot air exhausts out the back of the case. Also located at the back of the unit is the main power plug as well as an On/Off toggle switch. Over on the opposite side is where you’ll find your modular cable plugs. 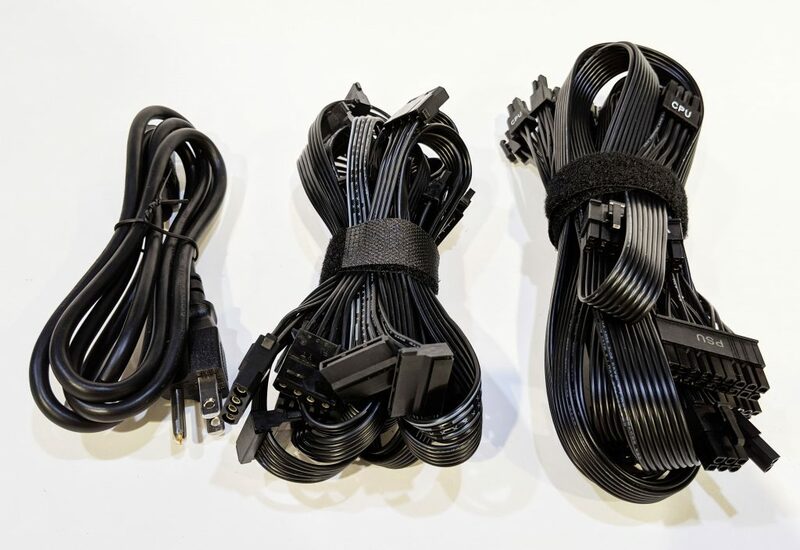 Each is easily identifiable, just be sure not to mix up the PCI-E and CPU power connectors to prevent damage to your PC’s Internals. Overall, I really like the looks of this particular power supply. It’s subtle and not over the top like some units we’ve seen in the past. 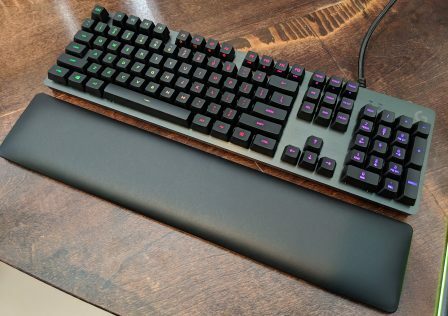 It would definitely be a welcomed companion to any dark, stealthy build. Caution: Do not open your power supply, especially if it has been powered on recently. Residual voltages may be present. With the warranty voided, we removed the outer cover to reveal the internal components. At first glance you’ll notice that the single +12V rail design keeps things simple overall. No red flags are immediately apparent. 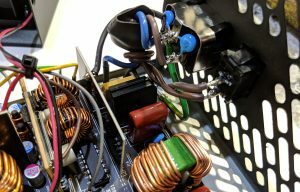 The internal wiring is bundled together nicely and anything that “might” move around such as tall components or plugs have been glued down or together. First, let’s take a look at the highly boasted 100% Japanese capacitors. The single main filter capacitor on the primary is a Nichicon 330uF/420V rated for 105 degrees Celsius. Nichicon caps are definitely considered high end and are well regarded as high quality especially in the PSU world. Secondary SMD caps on the +12, +5 and +3.3V side are CapXon which are Chinese brand and are not regarded as high quality. The DC-to-DC voltage regulation components that generate the +5V. -12V and +3.3V circuits consist of Infineon MOSFETs (BSC0901NS). The main PWM controller is an Anpec (APW7159C). These components are rated according to specified load. The PSU’s main switching MOSFETs consist of two half-bridge configured units which also share the same cooling component rail as the main driver. The heatsink is properly sized for the components despite all the sharing going on. Also, the main transformer also appears to be properly sized. As most of these are custom made rather than a specific part we don’t have any details on the specs. 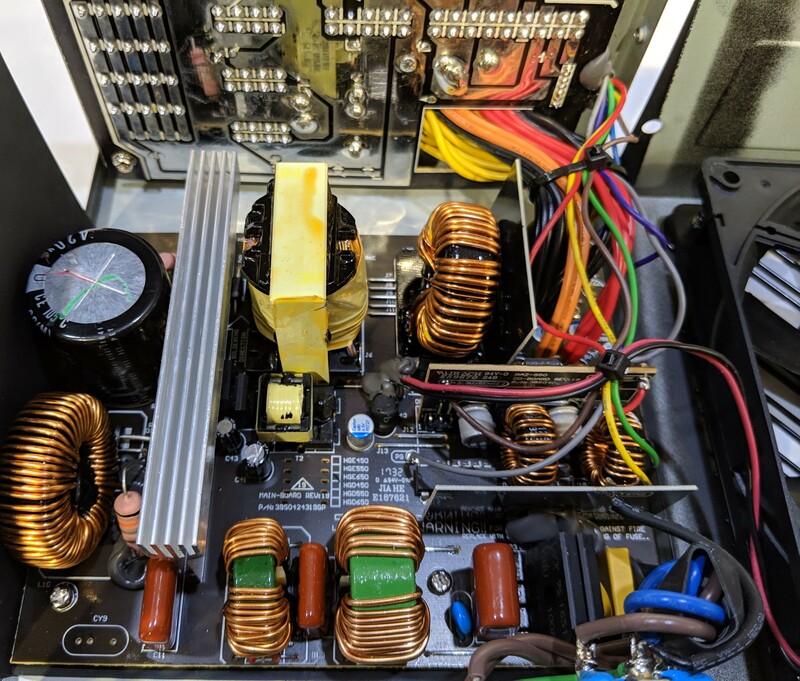 Moving over to the input side, the power is initially converted from AC to DC by a single full bridge rectifier (GBU1008) which is rated for 800V with a maximum surge current rating of 220A, definitely enough Daka for this particular unit. Max operating temperature is 150 degrees Celsius. Surrounding the rectifier is surge and noise reduction components. 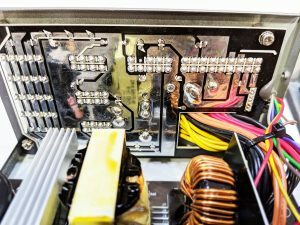 A single rectifier is plenty for a 650W unit. 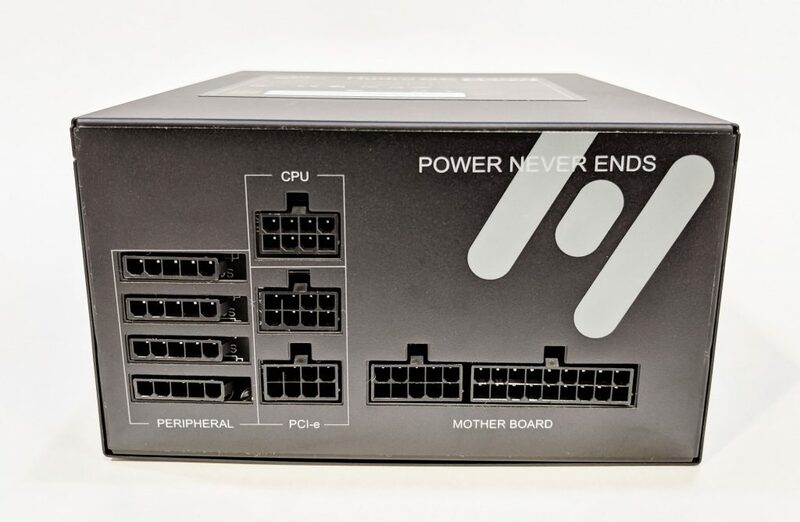 Typically in higher rated units around 850W and above we’ll see two of these running in parallel for 50% load splitting. 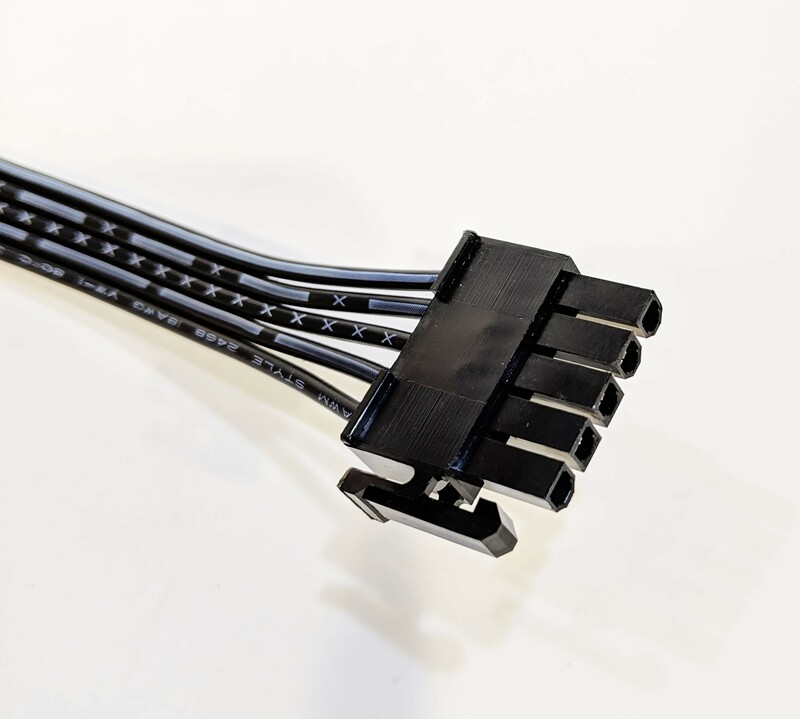 The modular cable plug PCB features clean and oversized traces rather than wires which we were happy to see. Common shared voltage ground planes are apparent as well. 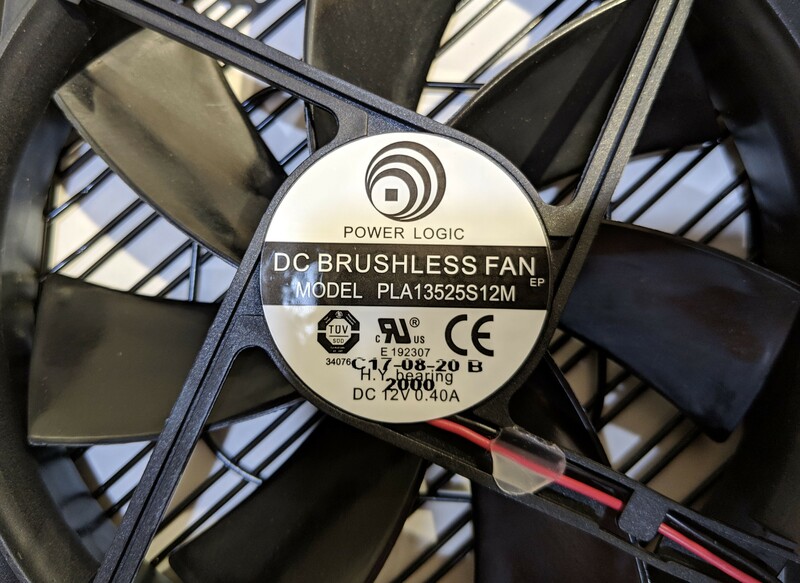 The main internal fan is indeed a 135mm fan which is a brushless DC fan (PLA13525S12M) manufactured by Power Logic. 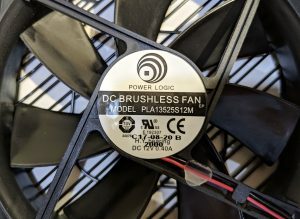 The fan runs at 12V DC with a maximum current rating of 0.40A. 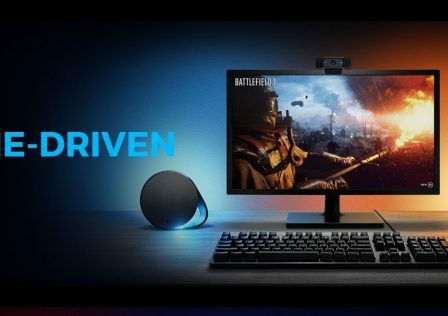 Overall, a good quality fan that should hold up for quite a long time. 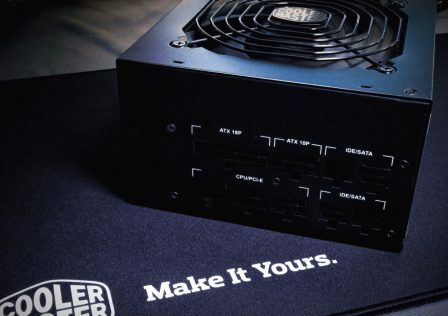 There are several factors we’ll be looking at while properly testing a PSU. One of the most important thing we look for is the behavior of voltage as the load on the PSU is increased. 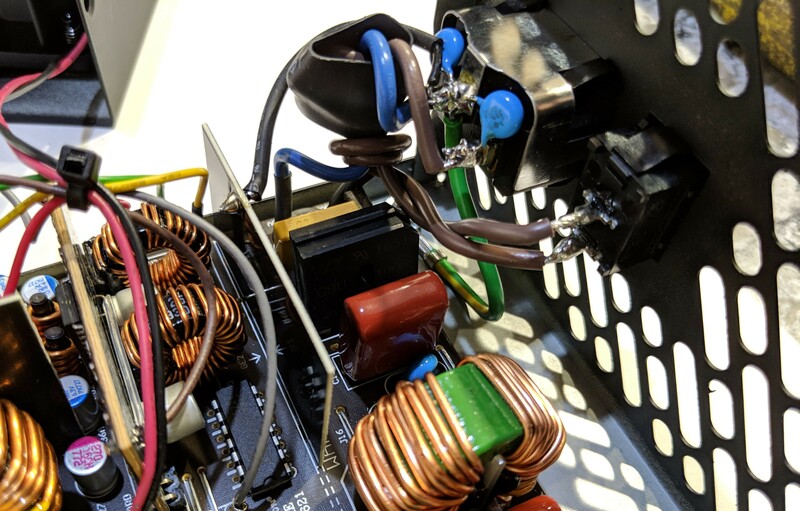 This is because when you see a voltage drop at mid to high loads, this can cause serious problems to internal computer components if the drop is significant enough. We will test this by placing a controlled load on the power supply and incrementing the load up by 50W for 5-10 minutes at each step. We will run each 50W increment as high as we can go before OCP kicks in (1050W if it will let us). 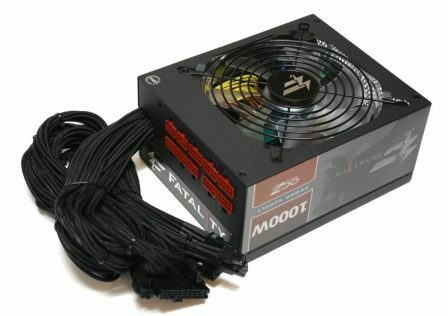 While this PSU is rated at 650W, there is a lot to be said for voltage stability past maximum ratings. We’ll be loading JUST the 12V power rail as it is used primarily by both the CPU and GPU. Why just the +12V rail? 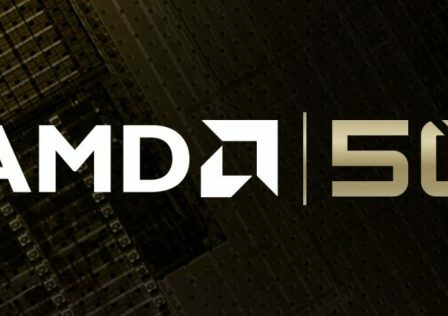 Because this rail is used almost exclusively by power hungry components such as your GPU and CPU. Components that load the +5V and +3.3V rails typically are standard across builds. 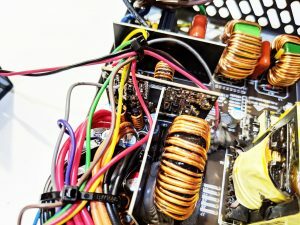 This is why you’ll see the same output ratings for those rails between 450W power supplies versus 1200W power supplies. They are normally static across all build types. While FSP claims an 80+ Gold efficiency rating (87%), we will also be performing our own efficiency calculations just to be sure. We will do this by placing a specific load on the power supply and then measuring the wattage going in to the power supply with our handy Killawatt meter. Lastly, at minimum, mid, and maximum loads we’ll be measuring voltage ripple and noise using a PC Oscilloscope. Noise or large voltage dips and spikes is the silent killer can be a huge contributor of early PC component failure if not properly checked. 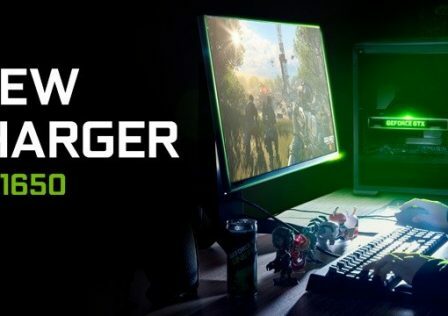 To provide a decent and accurate load you need more than just a beefy PC with high end components. Accuracy of load is vital to provide accuracy in the rest of the measurable points such as voltage @ x load, as well as efficiency calculations. To perform this test accurately we used our own home brew power supply load tester. More info on this tester can be found on our unofficial build page. The PSU will be tested with its exhaust partially restricted to simulate an in-case environment. 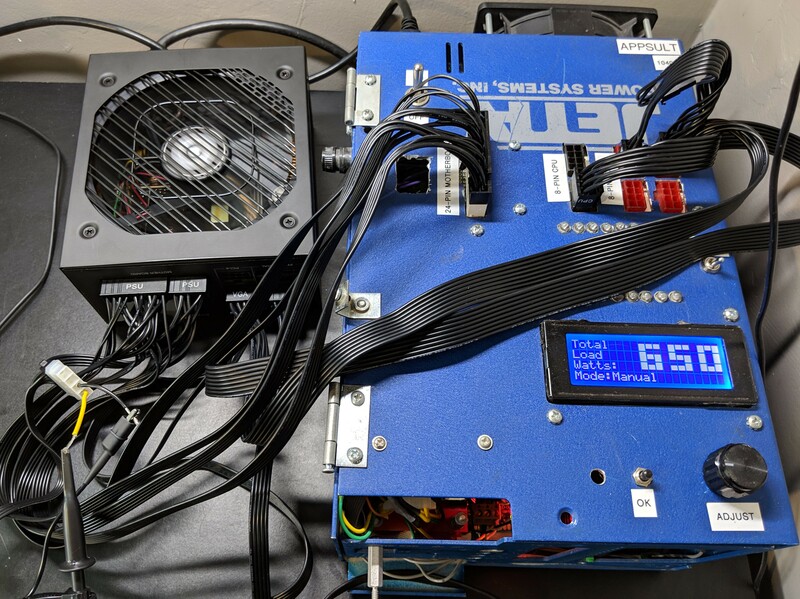 This simulates a real world, worse case setting where hot air would be sucked into the PSU thus increasing the temps a bit. 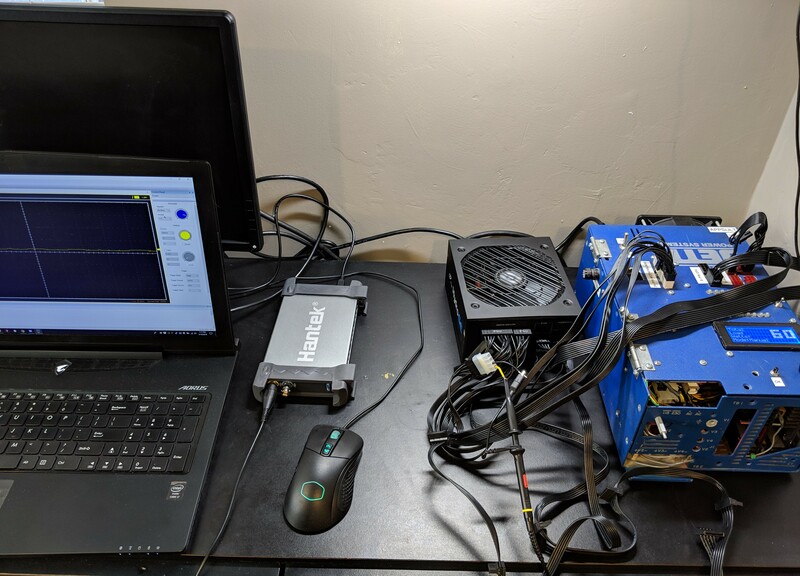 OCP kicked in at 740 watts of load which is about where we would expect it to hit to prevent damage to the internal components. Overall, stellar numbers especially under low load scenarios. 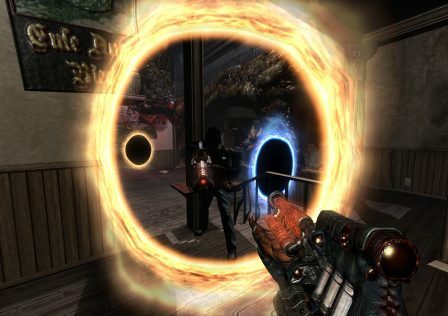 While your PC is idling you’ll be looking at 80+ Platinum level ratings. This particular test was interesting as typically we’ll see efficiency peak towards 50% load, however the decrease in efficiency was pretty linear with the amount of load placed on it. Voltage drop was apparent but marginal even up to 700W. Ripple was also minimal even up to the PSU’s maximum rating of 650W. 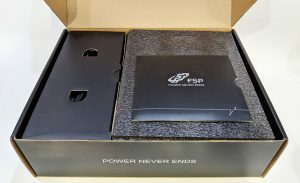 FSP has managed to produce an affordable 650W 80+ Gold rated power supply that put up a hell of a fight during our bench tests. 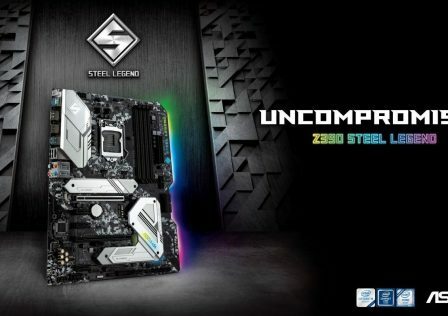 The internal components were of mostly good quality which should provide years and years of stable power to your build. 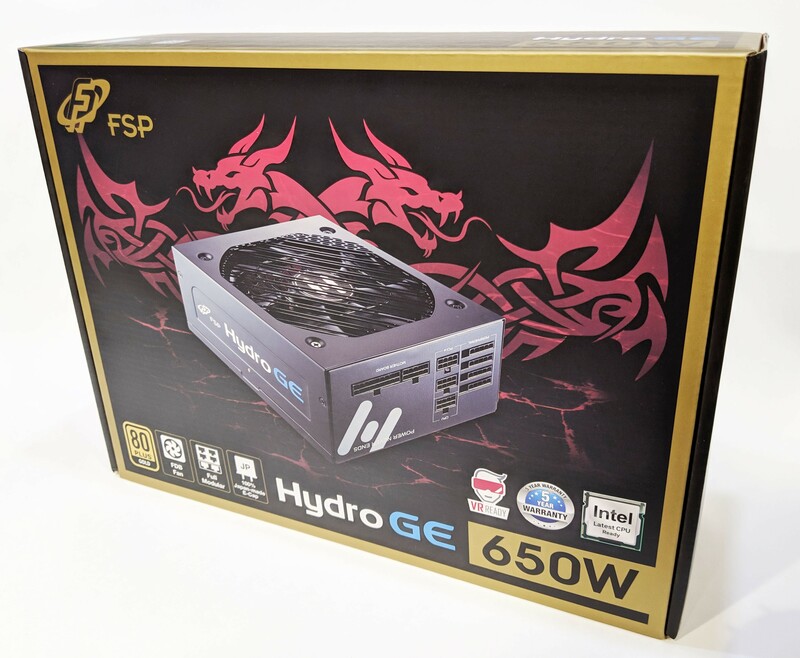 Not only was the FSP Hydro GE 650W a solid performer, it looks the part as well. Starting with its exceptional packaging, its’s simple, clean and doesn’t give off the impression that its over compensating in the visual department. The flat modular cables were another nice touch. They were easy to bend which should make installation and cable hiding a breeze. 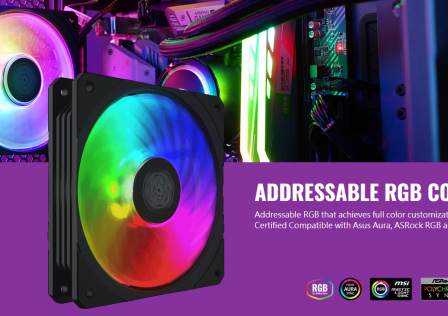 Appearance: 9.6/10 – The PSU really does look good, and will surely mesh well in any system. Including interchangeable stickers was a nice touch as well. Build Quality & Construction: 8.9/10 – The unit is solidly built inside and out. The cables and outer casing were strong and ridged and should have no issue standing up to abuse build after build. 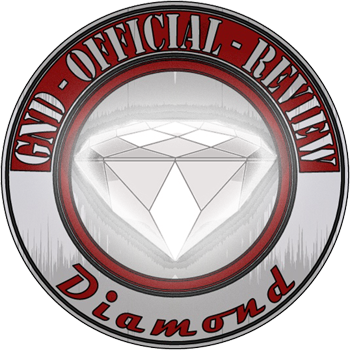 The internals were mostly of good quality and were properly sized to specifications. The main primary filter capacitor was indeed a highly regarded Japanese cap, however secondary capacitors were of lesser quality. 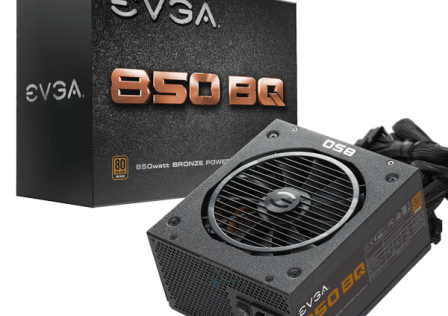 Performance: 8.5/10 – Overall, the PSU performed quite well during our tests. Voltage drop and ripple were well within exceptional margins. Efficiency was exceptional in low load scenarios though tapered off as its maximum rating was approached. 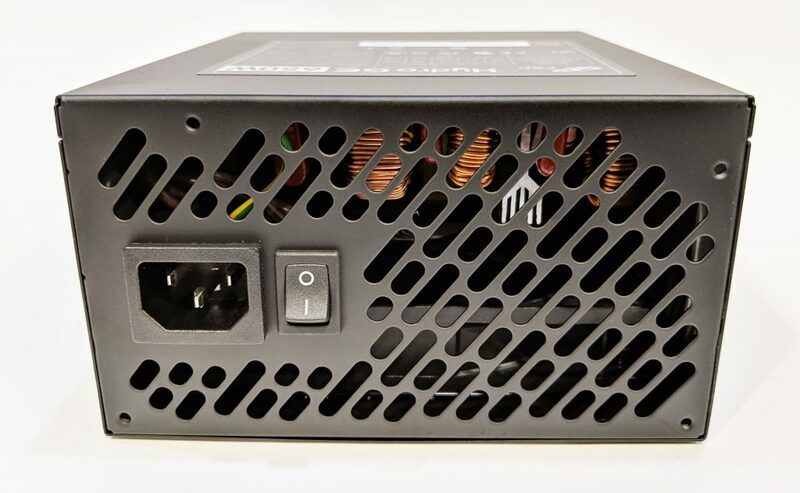 Value: 9.4/10 – The fact that you can pick up a 650W 80+ Gold rated PSU for $79.99 these days is outstanding. Considering how well the FSP Hydro GE did during our tests, and its overall quality, the price point is right on target to make this unit a good value overall. "...an affordable 650W 80+ Gold rated power supply that put up a hell of a fight during our bench tests."